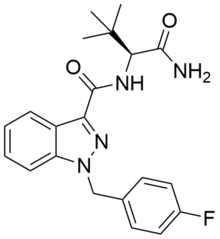 In the United States, 5DB-FUBINACA is a Schedule I controlled substance. ^ Uchiyama, N.; Matsuda, S.; Kawamura, M.; Kikura-Hanajiri, R.; Goda, Y. (July 2013). “Two new-type cannabimimetic quinolinyl carboxylates, QUPIC and QUCHIC, two new cannabimimetic carboxamide derivatives, ADB-FUBINACA and ADBICA, and five synthetic cannabinoids detected with a thiophene derivative α-PVT and an opioid receptor agonist AH-7921 identified in illegal products”. Forensic Toxicology. 31 (2): 223–240. doi:10.1007/s11419-013-0182-9. ^ Kevin G. Shanks; William Clark; George Behonick (April 2016). “Death Associated With the Use of the Synthetic Cannabinoid ADB-FUBINACA”. Journal of Analytical Toxicology. 40 (3): 236–239. doi:10.1093/jat/bkv142. PMC 4885918. PMID 26755539. ^ Jeremy Carlier; Xingxing Diao; Ariane Wohlfarth; Karl Scheidweiler; Marilyn A. Huestis (November 2016). “In Vitro Metabolite Profiling of ADB-FUBINACA, A New Synthetic Cannabinoid”. Current Neuropharmacology. 15 (5): 682–691. doi:10.2174/1570159X15666161108123419. PMC 5771045. PMID 29403341.